If you’ve been to one of our big New York events, you know that we are huge fans of Netroots Nation. In a way, our event is an effort to provide a taste of NN to folks who have never been there. They are a sponsor of Organizing 2.0, giving us three tickets last year, and three this year. I’ll be going, Elana is going, lots of good people are going. But what about you? Are you waiting for a special explanation of why this is not some kind of junket, but a truly valuable professional development opportunity for YOU that will pay dividends for the organization paying your salary? So here it is: the practice of online organizing or progressive blogging is still less than a decade old. But in that short time, the pace of change has been tremendous. Different people, tools, viewpoints and campaigns rise and fall. This fast paced, ever changing world COMES TO A SCREECHING HALT during Netroots Nation, because all of us are there, sharing, teaching, learning and of course, drinking. If you are on the edge, consider this. Elana and I hereby promise to babysit you. To discuss the offerings of each day and recommend speakers and sessions I can vouch for. We’ll hang out with you at mealtimes, wander the halls pointing out folks who probably share your interests, and share gossip. To the best of my knowledge, no other organization or fan of Netroots Nation has made that offer – so take advantage of it. If you’re already booked and on this list – please write back and let us know! Our friends and allies at Citizen Action New York are hosting an event in Albany for all New York State progressives and activist types. And they’re making a big effort to attract the netroots. The dysfunctional politics of New York City and New York State have created some real divisions. Well attended events where people from different ‘camps’ come together and interact in a serious way are few and far between. 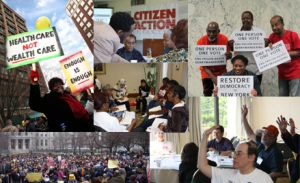 With Justice Works, Citizen Action is working towards an inclusive political agenda for the 2011/2012 season. They’ve asked us for help in turning out folks, because they want people like you to be there. The Organizing 2.0 leadership team will be there to help with some of the presentations. If the low low cost of $225 for our supporters (including the hotel room!) is a problem, ask me for help, maybe we can do something. Make sure to use the discount code ‘justice’ to get the $225 rate.